The symposium has been edited to include only the English portions. I have viewed the entire event and none of these videos are out of context. If you want to know the reason for this event, YOU CAN FIND OUT ALL ABOUT IT HERE. My thoughts: Having just finished watching this, I feel that this was, indeed, an excellent symposium as Professor Marianne H. Skanland has so aptly described in the comments below. It is wonderful to see Christian Austrians doing what they can to help suffering Norwegians. I enjoyed seeing people whom I have never met in person but whom I feel I know. I wish I didn’t have to see them discussing such a topic. However, it is inspiring to see people who will speak out against a cruel and unrelenting system that Norway calls the Barnevernet. Several Norwegians traveled to Vienna for this event. They are names that have been mentioned on this blog. There was the British/Austrian activist, Steven Bennett, who has been so helpful in getting this information out to Europe and the world. Behind the scenes and helping to organize this event was a young Christian man named Bjorn Korf. I wish to thank him and all who participated in this event. May God bless each of you as the valiant attempt is made to dismantle this evil government-sponsored family destroyer. I respect those who spoke. One would have to be callous to misunderstand the emotion in the voices. These are voices of strength, not of weakness. 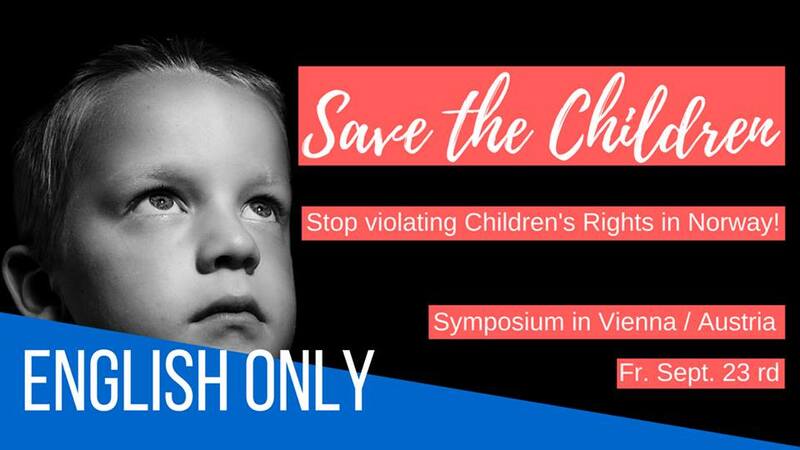 There is a Bible verse that states: “You reap what you sow.” I hope the good workers of the Norwegian CPS that do exist and the government entities responsible for actions like those mentioned in this symposium take heed. This entry was posted on Wednesday, September 21st, 2016 at 6:08 PM and is filed under Commentary, Education, Helps, LIFE, News. You can follow any responses to this entry through the RSS 2.0 feed. You can leave a response, or trackback from your own site. Amen and thank you, Pastor Jim. Excellent symposium! I watched it live on the internet. And I see we can click right into it at the top of your article, Chris. I am watching it right now, Marianne, and I am so glad to hear that you think so highly of it. I have just watched the interview with Nadia and Margaret and I am very happy that the people of Austria understand what is happening not far from their country and are willing to bring attention to this important issue. I am watching it on my own blog and I’m going to change the headline to make it a place to watch this event for those who are interested. What I have watched thus far has been outstanding and I am happy that this link has become permanently embedded in my blog. How does it feel when your child is taken away? Thank you for adding these videos to the main one, Marianne. It is wonderful to see Nadia with her son, Caspian. It is heartbreaking to see Amy without her son, Tyler. Nadia is one of the few and Amy is one of many. They have both been through an unnecessary time of great stress and in their young lives because of the Barnevernet of Norway. I am praying that Amy will be able to give a happier interview someday. The organisers have done a really good job. Here are two interviews, from 14 and 15 September, in German. The second one is texted in English. Thank you again, Marianne. I didn’t realize the second one had English text. Why this man of faith isn’t joined by every Christian leader IN NORWAY is something that I don’t understand.